Press kits or media kits are packages or website pages that contain promotional materials and resources for editors and reporters. The purpose is to provide detailed information about a company in one location. Although a press kit delivers more information than a press release, the overall goal is similar: to secure publicity for a company or client. 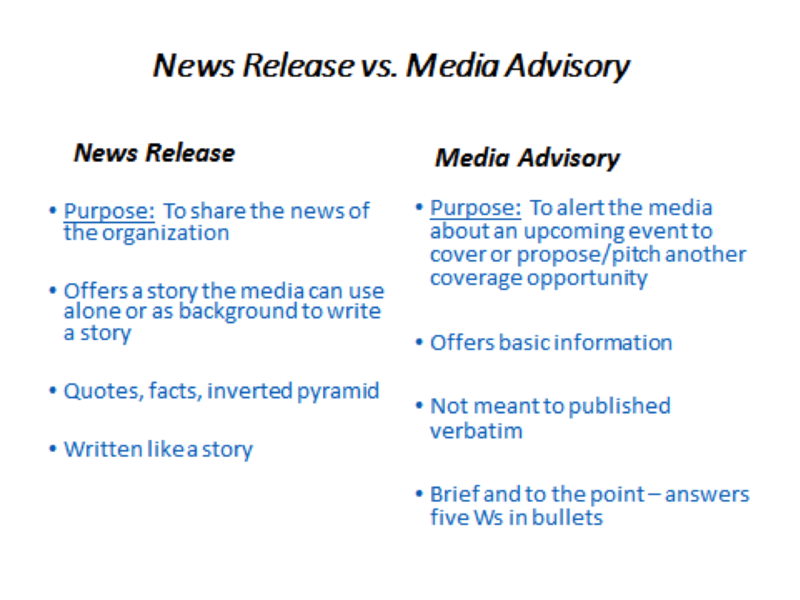 Major events or stories that require more information than is typically included in a press release warrant a press kit. Examples include a company merger, the launch of a new product, a rebranding campaign, or a major change in organizational leadership. Press kits can be hard copy or digital. Hard-copy press kits use folders with the company logo, whereas digital press kits use a website page or are sent in a zip file via email. Click here for information on how to assemble a press kit. A backgrounder contains the history of a company and biographies of key executives. The purpose is to supplement the press release and explain the company’s story or event, products, services, and milestones. It is in paragraph format and relatively brief (one to two pages). Click here for a sample corporate backgrounder from GainSpan, a semiconductor company (creator: Javed Mohammed). A fact sheet provides a summary of an event, product, service, or person by focusing only on essential information or key characteristics. It is more concise than a backgrounder and serves as a quick reference for reporters. However, the fact sheet is not meant for publication. The headings of a fact sheet vary; the creator of the document chooses how to categorize major information. The most common type of fact sheet is the organizational profile, which gives basic information about an organization. This includes descriptions of products or services, annual revenues, markets served, and number of employees. The standard fact sheet contains a company letterhead and contact information. The body is single-spaced, with an extra space between paragraphs and subheadings. Although the fact sheet is typically one page, put the word “-more-” at the bottom of the first page to indicate additional pages. Similar to the press release format, include three number signs or “-30-” at the bottom of the document to indicate the end. To make it easy to read, group similar information together and include bulleted items if appropriate. Click here for an example of a fact sheet. Keep in mind that the subheadings/categories used in this example may not be used in another one. Writers have some flexibility in the categories they choose in a fact sheet. There are times when announcements do not require the distribution of a press release, but rather a concise notice to the media. This is called a media alert or advisory. Media alerts are memos to reporters about an interview opportunity, press conference, or upcoming event. They use the 5Ws and H format to quickly deliver information.